A compact executive car is a premium car larger than a premium compact and smaller than an executive car. Compact executive car is a UK term and a part of the D-segment in the European car classification. They may have performance and comfort features, and thus are often viewed as status symbols; a high percentage of the "executive cars" market share consists of corporate-owned cars, or vehicles provided by a firm for the business and sometimes private use of an employee. The "compact executive car" description is not often used in the United States, but it describes certain models imported from Europe. The Cadillac ATS has been described as a compact executive car. 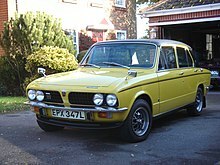 The 1971 Triumph Dolomite is an early compact executive car. Jaguar's first compact executive car (although larger than the 1960s' Jaguar Mark 2) was the 2001 Jaguar X-Type. Sales, however, were disappointing. The X-type was replaced by the Jaguar XE in 2014, competing in the same sector. The 1983 Mercedes-Benz W201 range (also known as the "Mercedes-Benz 190") was the first compact executive car from Mercedes-Benz. In 1993, the W201 was replaced by the Mercedes-Benz C-Class range.The C-Class is currently in its fourth generation and has been produced in saloon/sedan, estate/wagon, coupé, convertible and hatchback body styles. Citroën offers a compact executive with its DS 5 hatchback. The Volvo S60 as well as its estate version Volvo V60 are considered to be compact executive cars. An early compact executive car produced in Japan was the 1988 Mazda Persona / Eunos 300. The first Japanese compact executive car to be successful in overseas markets is the 1998 Lexus IS / Toyota Altezza. Other Japanese compact executive cars include the Infiniti Q50 (by Nissan), Acura TLX (by Honda) and Mazda Xedos 6. Compact executive cars produced in South Korea include the 2017 Genesis G70 and Kia Stinger. ^ "Executive Cars: Europe". statista.com. Retrieved 25 March 2019. ^ Jacobs, Andrew James (2016). The new domestic automakers in the United States and Canada: history, impacts, and prospects. Lexington Books. pp. 160, 169–170, 331, 412. ISBN 9780739188262. ^ "A 505HP Cadillac ATS-V May Be on the Horizon". www.motor1.com. Retrieved 25 March 2019. ^ "2020 Cadillac CT5 Sedan Will Replace ATS, CTS, XTS". www.autoevolution.com. 30 July 2017. Retrieved 25 March 2019. ^ "2018 Cadillac ATS Sedan Review, Trims, Specs and Price". www.carbuzz.com. Retrieved 25 March 2019. ^ "Wolves in sheep's clothing: the Q cars". www.autocar.co.uk. Retrieved 6 March 2019. ^ "Icon of icons: Autocar Awards Readers' Champion - BMW 3 Series". www.businesstelegraph.co.uk. 4 March 2019. Retrieved 6 March 2019. ^ a b "Jaguar X-Type Model Description, History and Parts Information". Jagbits. Archived from the original on 2017-07-06. ^ "Jaguar X-type Facelift". 16 July 2007. Retrieved 2019-02-03. By these standards, the X-type - like much of Jaguar's and Ford's performance in the past years, has been disappointing. X-type sales fell to 32,500 units in 2006, compared with BMW 3-series sales of over 500,000 units in the same year. ^ a b Daryl Lee (11 May 2018). "Car Review: Alfa Romeo Giulia Veloce is quite easily the best handling executive saloon". Singapore: Robb Report. Retrieved 2019-03-01. The Alfa Romeo Giulia (rival to the Audi A4, BMW 3 Series, Jaguar XE, Mercedes-Benz C-Class and even the Volkswagen Arteon) is the best looking compact executive saloon on sale today. [...] But all this shouldn’t come as any surprise. Alfa Romeo, after all, has a fantastic track record of making gorgeous compact executive saloons – the Giulia immediate forebears, the 159, 156, and 155 all come to mind. ^ "Compact Executives". www.autoexpress.co.uk. Dennis Publishing Ltd. 11 June 2007. Retrieved 2019-03-04. Let battle commence. Up for grabs is the title of world’s best compact executive car – an award BMW’s 3-Series has made its own since the launch of the current fifth generation in 2005. [...] Waiting in the wings to snap up buyers with an eye for style, value and individuality is the Alfa Romeo 159 2.4 JTD. ^ "As the final Lancia Lybra rolls out of the Mirafiori factory this month after a six-year stint, we pay tribute to this excellent, yet underrated, bearer of the famous shield". www.italiaspeed.com. Interfuture Media. 20 June 2005. Retrieved 2019-02-28. The Lybra's death brings to an end, at least temporarily, Lancia’s offerings in the compact executive class, a line which stretches back from the Lybra to the Dedra, Prisma, Beta and Flavia/2000. ^ Car: The Definitive Visual History of the Automobile. DK Publishing. 2011. p. 15. ISBN 9780756689384. Retrieved 2012-05-09. ^ Vijay Pattni (11 March 2014). "A brief history of the Mercedes C-Class". www.topgear.com. BBC. Retrieved 2019-03-01. The 190 kick-started the C-Class story: its successor, 1993’s ‘W202’ saloon, was the first to get the C-badge. ^ "Mercedes-Benz C-Class (1993-2000) used car review". www.rac.co.uk. RAC Motoring Services. 1 April 2009. Retrieved 2019-02-28. The range was launched in October 1993 to replace the popular 190 and featured a rather unique portfolio of trim packages which enabled the buyer to tailor each car to his or her own individual lifestyle. The surprisingly well appointed entry-level package was badged Classic, while those in search of brighter colours and a more youthful appearance could opt for similarly-priced Esprit models. ^ "Mercedes C-Class review". www.autoexpress.co.uk. Dennis Publishing Ltd. 17 January 2019. Retrieved 2019-03-12. The updates bestowed on the new Mercedes C-Class see Merc’s compact executive challenger return right to the sharp end of the class in style. We were so convinced we named it our Compact Executive Car of the Year at the 2018 Auto Express New Car Awards. . . . The C-Class was the junior Mercedes in 1993 when it first arrived, but the A-Class followed soon after as the German brand pushed deeper into the mainstream and an expanding A-Class range has pushed the C-Class further upmarket. The C-Class for sale today is the newly facelifted fourth generation model, and as well as the regular saloon you can buy a C-Class Coupe, a C-Class Cabriolet and a C-Class Estate. ^ "10 of the best compact executive cars". RAC Motoring Services. 15 January 2016. Retrieved 2017-02-11. ^ "Detailed specs review of 1989 Eunos 300 2000DOHC offered since October 1989 for Japan". www.automobile-catalog.com. Retrieved 22 March 2019. ^ "Car Reviews: Lexus IS200 Sport - The AA". www.theaa.com. Retrieved 22 March 2019. ^ "Lexus IS200". www.autoexpress.co.uk. Retrieved 22 March 2019. ^ "10 of the best compact executive cars". www.raccars.co.uk. RAC Motoring Services. 15 January 2016. Retrieved 2019-03-03. The Infiniti Q50 is a forgotten compact executive contender. It’s Nissan’s successful upmarket brand taking on Europe with a dedicated compact saloon model, and there are several attractions such as a high-quality interior and gadget-packed cockpit. Another non-obvious choice. ^ "The History and Evolution of the Acura TLX". www.moneyinc.com. 12 December 2018. ^ "Acura's 2018 TLX a bargain of an entry-level luxury sedan". www.boston.com. 14 June 2017. Retrieved 13 March 2019. ^ "We drove a $54,000 Audi A4 and a $46,000 Acura TLX to see which luxury sedan we liked better — here's the verdict". www.businessinsider.com.au. 12 April 2018. Retrieved 13 March 2019. ^ Jonathan Crouch (10 October 2005). "Mazda Xedos 6 (1992 - 1999) used car review". www.raccars.co.uk. RAC Motoring Services. Retrieved 2019-03-02. The Xedos 6 was the car that launched the Xedos (pronounced 'ker-see-dos') brand back in 1992, Mazda's attempt to break into the BMW, Mercedes and Audi-dominated compact executive saloon sector. This page was last edited on 3 April 2019, at 18:29 (UTC).